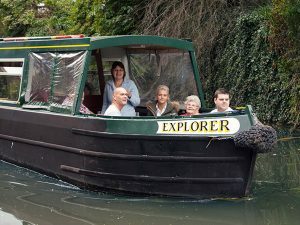 Hire one of our narrow boats for a day and enjoy a tranquil boat trip along pictuesque rivers and spy the plethora of wildlife that lives on the fenland waterways. You can reach Ferry Meadows at Peterborough The day boats will carry up to 10 people. They are ideal for friends and family with lots seating at the front so everyone can enjoy the fresh air with a mug of hot tea. In case of a rain shower there is a see through cover at the front and plenty of seating inside. All our boats are pet friendly. We have become known as March Wharf we are now a hirebase for ABC Boat Hire. On board is a galley / kitchen area complete with hob, fridge and a sink. It comes complete with a dinette, equipped with crockery and cutlery. In addition there is a toilet and seating area. Alternatively take a trip westwards towards Peterborough passing Floods Ferry Marina Park arriving at Ashline Lock and the town of Whittlesey. 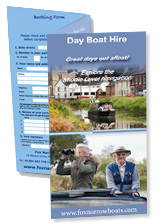 More about our day boat hire routes or download our complete waterways map below. 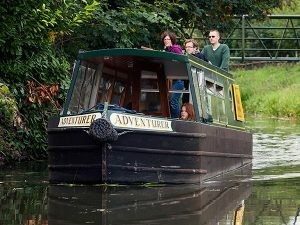 Our Day Boat Hire is available to book online on boats March Adventurer and March Explorer. Alternatively call our friendly reception staff who will advise and help you book. Our day boats are popular at weekends especially in the summer months so be sure to book early.